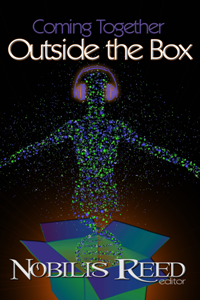 >> Coming Together and editor Nobilis Reed are pleased to announce the contents of the upcoming collection, Coming Together: Outside the Box, an anthology is dedicated to PG Holyfield, who passed on August 20, 2014 after a brief and vicious battle with cholangiocarcinoma. All proceeds from sale of this anthology will go to The Cholangiocarcinoma Foundation, a research foundation dedicated to collaboration, understanding, research, and education of this rare but deadly disease. PG Holyfield’s novel, Murder at Avedon Hill was one of the first “podcast novels” and his work in this area marks him as one of the pioneers of the podcast novel form. Due to PG’s years of work as an audio podcaster, an audio edition of the anthology is also planned. This will be the third Coming Together anthology edited by Nobilis Reed. His previous anthologies areComing Together: In Flux and Coming Together: Arm in Arm in Arm….